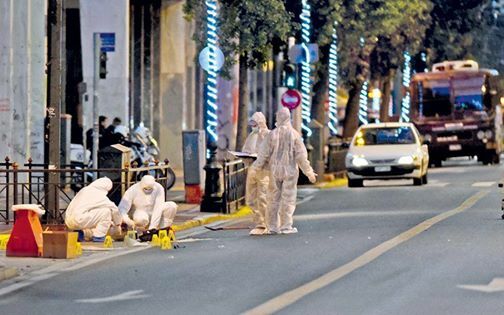 25.02.17: According to the corporate Greek media police bomb disposal experts defused an explosive device comprising of a hand grenade on Saturday after an anonymous caller telephoned a threat that the bomb would detonate outside the police precinct in Dafni, southern Athens. The bomb was found in a bag that had been placed in a small park behind the police precinct. The bomb is said to have had an unusual composition: a hand grenade, a timer, a detonator, a battery and an undisclosed amount of explosives. It was destroyed in two controlled explosions. The anonymous caller who phoned the police shortly before 3 a.m. had warned that the bomb would go off in 40 minutes from then. The caller said the attack would be in memory of Lambros Foundas, a member of Revolutionary Struggle who died in a shootout with police in the area in March 2010.